Oscar Casares is the author of the novel Amigoland (Little, Brown, 2009) and the short story collection Brownsville (Little, Brown, 2003). His fiction has been published in the Threepenny Review, the Iowa Review, and Northwest Review, as well as other journals and anthologies. His essays have appeared in the New York Times, Texas Monthly, and on National Public Radio. He teaches creative writing at the University of Texas in Austin, and is the former director of the New Writers Project, one of the university’s two MFA programs in creative writing. He lives in Austin with his wife and two young children. His website is www.oscarcasares.com . I suppose it is a little weird that someone who grew up in Brownsville, Texas, a remote town along the U.S.-Mexico border with no real bookstore or even a public library, would be writing a literary guide for a city like Austin, Texas. Then again Austin is a city where being weird is both a way of life and a slogan—“Keep Austin Weird”—you’ll find on bumper stickers all over town. And if growing up on the border gave me my voice and the material for my stories, it was moving here to this sometimes strange and eccentric place that would one day give me the freedom to actually write those stories and eventually my first book. Of course, weirdness can be a matter of opinion, especially in a state as conservative as Texas. For instance, some people believe it was weird that for years Austin had a huge festival called SPAMARAMA, an annual cook-off involving the famed luncheon meat and featuring all sorts of acquired tastes such as SPAM ice cream, Moo Goo Gai SPAM, and SPAMALAMA Ding Dongs. This is also the city where every spring thousands of people still gather in a city park for Eeyore’s Birthday, a daylong event celebrating the depressed donkey from the Winnie-the-Pooh stories. And Austin is the city where the late Leslie Cochran, a cross-dressing homeless man, became so popular you could buy a refrigerator magnet bearing his likeness, complete with changeable outfits, his most fashionable being the leopard thong and high heels. As I said, it’s a matter of opinion. And so it was in Austin, a city known for alternative lifestyles and, sometimes, for being just plain weird, where one morning I walked into my boss’s office and quit my job. There was nothing wrong with the job I had as a copywriter for the previous eight years; it paid well and I had plenty of friends. The only problem was I had found something I wanted to do more. I was thirty-two at the time and had been writing stories for just five months, total, with nothing published or read by anyone but a few friends. After I quit, I told my family that I could always turn around, get my old job back, if things didn’t work out. I even told myself this, when I stopped long enough to consider what I had just done. This was just the beginning, when I didn’t realize how little I knew about writing fiction and that it would be sometime before my work was published, but I was lucky to be in a city where doing something a little different wasn’t only possible, it was expected. The following is a list of some of the landmarks, museums, book festivals, and bookstores you may want to visit if you make it to town. Most of them are more literary than actually weird, but all of them are unique to Austin. Every fall the Texas Book Festival  spreads itself out across practically every corner of the state capitol building and its grounds during what turns out to be the most glorious weekend of the year. Or at least it seems like the most glorious weekend after several summer months of one-hundred-degree weather. In 1995, six years before she hosted the inaugural National Book Festival, First Lady Laura Bush established the Texas Book Festival to celebrate Texas writers, encourage reading, and raise funds for the state’s public libraries. These days the festival hosts over two hundred Texas, national, and international authors. Salman Rushdie, Margaret Atwood, Jane Smiley, Tim O’Brien, and President Barack Obama are just a few of the writers who have presented in the past. Readings and panels by some of the best-known authors take place in the Senate or House chambers, while many others are held in the Capitol Extension Rooms, which are actually subterranean and accessible by a tunnel connected to the capitol. The festival even extends beyond the capitol grounds into downtown and East Austin where you'll find the annual Literary Death Match  and Lit Crawl  with authors speaking at various stops along the route, including a drive-in theater, a beer garden, and the Texas State Cemetery. I’ll let you decide how weird that last one might be. Now going on its thirty-third year the Austin Jewish Book Fair , held at the Jewish Community Association of Austin (7300 Hart Lane), cosponsors a few of the authors at the Texas Book Festival and later hosts its own weeklong series of book events, a few of which require the purchase of a ticket. Past presenters have included Rebecca Goldstein, Elie Wiesel, Lawrence Wright, Jennifer Weiner, and Jonathan Safran Foer. The fair generally runs from early to mid-November. With over two hundred fifty poets from as far away as Australia, Singapore, and Nigeria, the Austin International Poetry Festival  bills itself as “the world’s largest non-juried poetry festival.” It is also the festival with the largest number of venues throughout Austin. From the hippest coffee shops to a retirement home, bookstores to museums, a South American restaurant to a historically black university, you can attend readings, workshops, and open mikes at over two dozen locations, all of which make it a great way to see the city. The festival takes place this year from April 7 to April 10. The Texas Teen Book Festival , formerly the Austin Teen Book Festival, is held at St. Edward’s University in South Austin and connects teens with authors of books for teens, otherwise known as young adult literature and one of the few areas of the publishing industry that is doing well. Now in its seventh year, the festival has hosted authors such as Cristina García, Varian Johnson, Margo Rabb, and Scott Westerfeld. The festival is a collaboration with the Texas Book Festival, BookPeople, and volunteer librarians. The Austin Public Library Friends Foundation, which established the festival, also hosts a variety of other events such as the New Fiction Confab with well-known authors leading workshops, giving readings, and discussing their work. Over the last six years, the Confab lineup has featured Kevin Brockmeier, Nell Freudenberger, ZZ Packer, and Wells Tower. The African American Book Festival  takes place in the Carver Museum (1165 Angelina Street), which was the original Carver Branch Library, just east of I-35 in the Rosewood neighborhood. In this once legally segregated city—west being white, east being African Americans and Mexican Americans—the summer festival represents an important voice in the community and helps to promote empowerment through literature. Listed in the National Register of Historic Places and recognized as a Texas Historic Landmark, the Dobie House (702 East Dean Keeton Street) is the former home of American folklorist J. Frank Dobie. The house, located on the northeast edge of the University of Texas campus, is now home to the Michener Center for Writers , named after James Michener whose endowment established the interdisciplinary master of fine arts program in fiction, poetry, playwriting, and screenwriting. Michener fellows, together with MFA students in the New Writers Project , attend seminars and workshops in the upstairs library. You can see the extent of J. Frank Dobie’s imprint on the city by visiting Philosopher’s Rock in Zilker Park (2201 Barton Springs Road), a life-size sculpture of Dobie and two of his close friends—naturalist Roy Bedichek and historian Walter Prescott Webb—lounging after a swim. The sculpture is located at Barton Springs, a spring-fed swimming hole and one of Austin’s most popular landmarks. ­The O. Henry Museum  (409 East Fifth Street) was the home of the famed short story writer before he was famed or a writer or even named O. Henry. As the story goes, William Sydney Porter arrived in 1884, and years later, while working as a teller, a bank examiner accused him of stealing and he was sentenced to five years in federal prison, where he assumed the pen name O. Henry and began writing short stories. Maintained by the city, the museum is a National Literary Landmark and listed on the National Register of Historic Places. For the last thirty-eight years, every spring the museum has also been the site of the O. Henry Pun-Off World Championships , described on its website as the “highest expressions of the lowest forms of humor.” Depending on your tolerance for an afternoon of word play during the two competitions—Punniest of Show and Punslingers—this will qualify for either being weird or just silly. The Nettie Lee Benson Latin American Collection  also at the University of Texas (Sid Richardson Hall) is the largest university library collection of Latin American materials in total number of volumes in the United States—including 970,000 books, periodicals, and pamphlets; 40,000 periodical titles; 4,000 linear feet of manuscripts; and thousands of other archival materials. The collection is particularly focused on current information about Mexico, Brazil, and the countries of the Río de la Plata. Within its Mexican American Library Program, you will also find relevant current and retrospective books about Mexican Americans and Latinos in the United States. The collection contains the papers of prominent literary figures such as Américo Paredes, Gloria Anzaldúa, and Rolando Hinojosa. The Southwestern Writers Collection , located at the Albert B. Alkek Library on the campus of Texas State University in San Marcos, is worth the thirty-minute drive from Austin to San Marcos. Although the more renowned writers in this collection have some connection to Texas or the Southwest, either by birth or their subject matter, their impact extends to American letters. The collection includes the papers of Cormac McCarthy, Sandra Cisneros, Katherine Anne Porter, Larry McMurtry, Sam Shepard, Molly Ivins, Edwin “Bud” Shrake, John Graves, and Tino Villanueva. And as long as you are taking this side trip, you might want to also stop by the Katherine Anne Porter Literary Center  (508 Center Street in Kyle, between Austin and San Marcos), the childhood home of the Pulitzer­­­–Prize winning author and now the setting for a literary reading series sponsored by Texas State University. Built in the late 1800s, the house is recognized as a National Literary Landmark and listed on the National Register of Historic Places. The center is open to visitors by appointment. BookPeople  (603 North Lamar Boulevard) may not be as big as Strand Book Store in New York City or Powell’s City of Books in Portland, Oregon, but it is the largest independent bookstore in Texas and one of the handful of independent stores located in central Austin (the Barnes & Noble stores can be found out toward the burbs). But BookPeople’s success isn’t such a big surprise when you consider Publishers Weekly regularly voted it the “Bookseller of the Year” and, for the last twenty-two years, the Austin Chronicle has declared it “Best Bookstore in Austin.” Can I say everybody’s been there to read and sign books? Michael Chabon, Jamie Lee Curtis, Muhammad Yunus, Condoleezza Rice, Madeleine Albright, David Sedaris, Sarah Vowell, Jimmy Carter, Bill Clinton, Rachael Ray, and the rest you’ll need to check out yourself on the website. BookPeople is also where you’ll find all your “Keep Austin Weird” items, including T-shirts, caps, coffee mugs, and bumper stickers. Resistencia Bookstore  (4926 East Cesar Chavez Street), opened in the early eighties by the late great Chicano poet and community activist Raúl Salinas, continues to offer readings and political forums that present nationally and internationally recognized writers, human rights activists, and indigenous artists. Here you will find titles from many of those writers of color who generally get marginalized to one section of the store in most of the major chains, if they make it in at all. Over the past thirty-five years Resistencia has stayed true to its long tradition of grassroots activism, giving voice to issues important locally, nationally, and throughout the Americas. 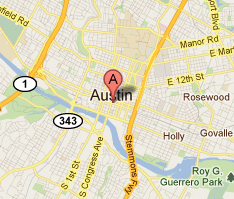 As with all tours, these sites and events are mainly the highlights and not everything Austin has to offer. For instance, I didn’t get around to the music or the food or the lake or the hill country. So I recommend visiting the places I listed here, attend some of the events, but then let yourself get a little lost in this city too. Find that all-night coffeehouse where you can read until the morning rush, find that bar that has spoken word on Thursday nights, find the outdoor poetry reading that happens under the giant oak trees. Stay long enough and you may find yourself doing something a little weird, maybe even writing your own book.